Getting the most out of piano lessons. As a teacher, there is nothing more satisfying to me than to see your child develop a love and appreciation for music and to enjoy playing the piano. As a parent, I'm sure you want this too. I strongly believe that we can accomplish this if we work together. Because I have only 30 or 40 minutes a week to work with your child, how much and how well your child practices at home is critical. It is during this time of home practice that most progress is made. This is where you, the parents, have a crucial role to play. The following is a checklist of important things you can do to make sure your child is getting the most out of piano lessons. Many of these suggestions are simple, but can truly make all the difference. Make sure your child knows that you consider music a serious commitment. Children are usually no more committed to piano lessons than their parents are. They readily sense their parents' expectations and will act accordingly. Daily practice is essential. 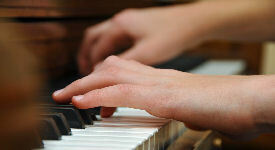 Piano practice is a physical and mental skill that requires daily repetition to be effective. It is better to practice for shorter periods every day (20 minutes for example) than it is to skip several days and then try to make up for lost time with one or two extended practice sessions. The muscles tend to "forget" much faster than the brain does, and therefore, it is necessary to have physical reinforcement of piano skills every day. Practice at the same time each day. Students who do this usually make better progress than those who don't. Practicing at random or inconsistent times can easily make piano a low priority item placed at the end of a busy day of school, homework and extracurricular activities. The student is then too tired to accomplish much, if anything. Practice without distraction - a TV going, a noisy room, or siblings running around can make productive practicing impossible. If the student is to respect the daily practice time, so must the rest of the family. Be sure practice is productive. Sloppy practice brings sloppy results. The number one mistake of most piano students is not practicing enough. This can be dangerous to the success of the student. They can develop the attitude that they don't like playing the piano simply because they aren't practicing enough to get good at it. How much and how well your child is practicing is easily determined by the results: If your child cannot play through their pieces at least slowly, they have not put in enough practice and are not ready for their lesson. If they can play through, but start and stop constantly or play lots of wrong notes, they are practicing too fast and need to slow down. If they struggle to find where their hands go for the piece, they probably didn't practice at all. Follow the order on the assignment sheet. Do the technique/scale work first as this warms up the brain, eyes, ears and fingers. Then review and polish up previously assigned music before working on new pieces. Theory and flashcards complete the assignment. For new music, learn the notes with the correct fingers and rhythm by slowly playing hands separately about 3-5 times or until there are no mistakes. Then practice hands together slowly until the piece can be played through without stopping or mistakes. The metronome should be used from the beginning and small sections of the piece worked thoroughly before moving on to another section. Now, add all the details marked in the music by the composer. These details turn the notes into music. Finally, get the piece up to tempo by GRADUALLY increasing the speed. ***The number one way students waste practice time is by practicing too fast too soon. *** Fast tempos come gradually after all the elements of the piece have been mastered. As a rule, when learning a new piece, the slower the practice, the faster learning takes place. This is the most important practice suggestion I can make and it takes the most discipline to follow. Encourage your child as much as possible and give genuine praise for effort as well as accomplishment. Consider a weekly or monthly in-home recital so that the family can show appreciation for the hard work. To get the most out of the piano lesson, the student should strive to come to each lesson having exhausted his own personal means of mastering the music. Too much lesson time is wasted when the teacher has to correct the mistakes of careless practicing at home. It is the student's job to learn the notes and rhythm well enough so that the teacher can help them make music. Set a standard at home and be consistent. A successful piano student rarely exists without a parent's active involvement and encouragement to practice each day.